What is a South Carolina Sublease Agreement? South Carolina Sublease Agreement: What Is It? 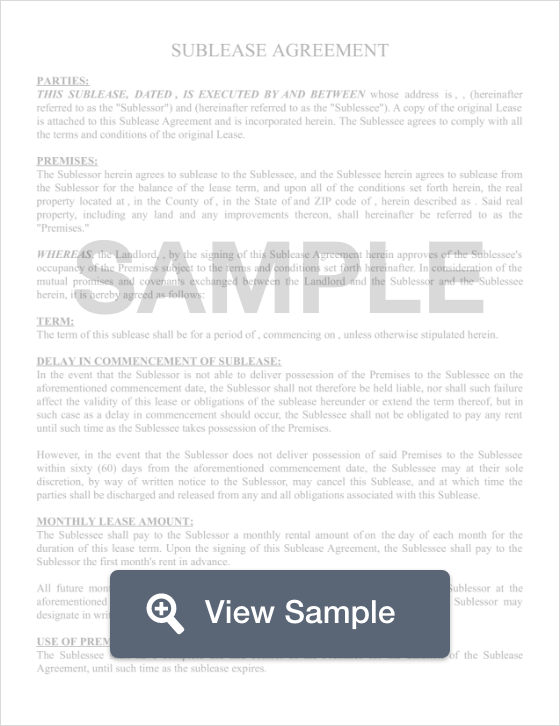 A South Carolina Sublease agreement is a document that establishes a peer-to-peer tenancy agreement between two tenants. The first tenant in the agreement, known as the sublessor, is the original tenant who signed a leasing agreement with a landlord. This tenant, for whatever reason, will be absent from the rental for a period of time and will seek out another tenant, known as a sublessee, to rent the unit while they will be gone. This type of agreement works well for all parties involved, as the sublessor gets to handle his or her affairs out of town, the sublessee gets flexible short-term housing, and the landlord never sees a lapse in rent. One important thing to note about sublease agreements is that any missed rent payments or damage to the unit will be the responsibility of the sublessor and not the sublessee. This is because the sublessor is the individual who has a contract and obligation to the landlord. According to South Carolina’s Sublease laws, a tenant’s ability to sublease lies in the landlord’s willingness to allow it. If a tenant wishes to sublease their rental, they must receive written permission from the landlord that proves that they have permission to do so.